The mannose 6-phosphate/insulin-like growth factor-II receptor (M6P/IGF2R) is a multi-functional protein that has been implicated in regulation of cell growth and apoptosis. Cardiac myocytes express relatively high levels of M6P/IGF2R, and cardiomyocyte apoptosis has been identified in a variety of cardiovascular disorders, such as myocardial infarction and heart failure. However, involvement of M6P/IGF2R in the pathogenesis of these conditions has not been determined. Thus, the objective of this study was to determine the role of M6P/IGF2R in regulation of cardiac myocyte growth and apoptosis. We down-regulated the expression of M6P/IGF2R in neonatal rat cardiac myocytes and examined the effect on cell proliferation and apoptosis. Infection of neonatal cardiomyocytes with an adenovirus expressing a ribozyme targeted against the M6P/IGF2R significantly reduced the level of M6P/IGF2R mRNA, as determined by RT-PCR and Ribonuclease Protection Assay (RPA). M6P-containing protein binding and endocytosis as well as the M6P/IGF2R-mediated internalization of 125I-IGF-II were lower in the ribozyme-treated cells than the control myocytes, indicating that the number of functional M6P/IGF2R in the ribozyme treated cells was reduced. Accordingly, a marked increase in cell proliferation and a reduced cell susceptibility to hypoxia- and TNF-induced apoptosis were observed in the ribozyme-treated cells. These findings suggest that M6P/IGF2R may play a role in regulation of cardiac myocyte growth and apoptosis. Down regulation of this gene in cardiac tissues might be a new approach to prevention of cell death or promotion of mitogenesis for certain heart diseases. The mannose 6-phosphate/insulin-like growth factor-II receptor (M6P/IGF2R) is a unique protein that interacts with multiple ligands, some of which are important growth regulatory factors . The M6P/IGF2R participates in internalization and lysosomal degradation of IGF-II, a mitogen normally acting through the IGF-I receptor to stimulate cell proliferation . The M6P/IGF2 receptor is required for the activation of TGF-β , a potent growth inhibitor for many cell types. This receptor is also involved in the binding, transport and activation of newly-synthesized lysosomal enzymes, such as cathepsins [4, 5], which have been recently implicated in the induction of apoptosis . On the basis of these functions, the M6P/IGF2R has been proposed to play a significant role in regulation of cell growth and apoptosis . Apoptosis, or programmed cell death, is a tightly regulated process used to remove excess, hazardous or damaged somatic cells, and is crucial for the development, maintenance and survival of an organism. However, alterations in the control of apoptosis have also been shown to contribute to human diseases. In fact, morphological and biochemical markers of apoptosis have been identified in a wide variety of cardiovascular disorders, including myocardial infarction and heart failure. This suggests that activation of apoptotic pathways contributes to cardiomyocyte loss and subsequent cardiac dysfunction in these conditions. A number of factors involved in cardiomyocyte apoptosis are currently known and include insulin-like growth factor-I (IGF-I), stress-activated protein kinases (SAPKs) and the anti-apoptotic Bcl-2 family . There are indications that other factors may be involved in induction and regulation of cardiac apoptosis. However, these potential factors and their corresponding mechanisms have not been identified. Several lines of evidence point to the potential involvement of M6P/IGF2R in cardiac myocyte proliferation and apoptosis. Cardiac myocytes express relatively high levels of M6P/IGF2R and transgenic mice containing a homologous deletion of the M6P/IGF2R gene manifest ventricular hyperplasia due to an increase in cell number [9, 10], suggesting that the M6P/IGF2R normally acts to suppress cardiac myocyte cell growth. It has also been shown that TGF-β, a potent growth suppressor whose activation requires the binding of latent TGF-β to M6P/IGF2R , is commonly upregulated in chronic heart failure . Additional evidence for the involvement of M6P/IGF2R in regulation of apoptosis comes from studies of tumorigenesis. It has been shown that M6P/IGF2R expression is significantly reduced in a variety of tumors and loss of heterozygocity (LOH) at the M6P/IGF2R gene locus 6q26 have been found in breast, liver cancers and squamous cell carcinoma of the lung [12–15]. Although several studies have examined the effect of M6P/IGF2R over-expression on cell growth , it is not known whether down-regulation of this receptor protein leads to cellular protection against apoptosis. Ribozymes are catalytic RNA molecules that cleave a complementary mRNA sequence , thereby inactivating specific mRNAs and suppressing gene expression in vitro and in vivo [17, 18]. Ribozymes have been shown to be highly specific, efficient and stable. They can be packaged into viral vectors to enhance transfer into cells and to achieve longer expression compared with naked oligonucleotides. In the present study, we employed ribozyme technology to study the role of M6P/IGF2R in regulation of cardiac myocyte cell growth. A hammerhead ribozyme against the M6P/IGF2R mRNA was constructed and packaged in an adenoviral vector. We then examined the effect of ribozyme-mediated down-regulation of M6P/IGF2R expression on cell growth and hypoxia- and TNF-induced apoptosis. The M6P/IGF2R ribozyme we constructed has 13-bp binding arms complementary to the target site of M6P/IGF2R mRNA, and a catalytic core (Fig. 1A). To evaluate the bioactivity of the ribozyme and the accessibility of the target site, a cleavage reaction was performed in vitro. The substrates, [α-32P] labeled RNA transcripts containing 45 bp of M6P/IGF2R mRNA or an unmatched sequence, were incubated with the ribozyme as described (see Materials and Methods). The ribozyme cleaved only the specific M6P/IGF2R mRNA into the expected products. In the assay of time course, the hammerhead ribozyme was able to cleave 24.2% of the M6P/IGF2R target within 10 minutes of incubation, 50.3% of the M6P/IGF2R target within 40 minutes of incubation, and by 640 minutes, 80.8% of the M6P/IGF2R target was converted to the expected products (Fig. 1B). This ribozyme did not digest the unmatched sequence (Fig. 1B). These results indicate a high efficiency and specificity of the ribozyme in vitro. Hammerhead ribozyme structure and target sequence of the M6P/IGF2R mRNA (A) and ribozyme activity against M6P/IGF2R RNA in vitro (B). 32P-labeled RNA containing the M6P/IGF2R target sequence was incubated with the hammerhead ribozyme and the reaction products were separated by polyacrylamide gel. The ribozyme cleaves the M6P/IGF2R target efficiently and specifically in vitro. Lane 1: Specific target alone; Lane 2: Specific target incubation with ribozyme at time 0; Lane 3–10: Specific target incubation with ribozyme at a time-course of 5, 10, 20, 40, 80, 160, 320 and 640 minutes; Lane11: Unmatched target alone; Lane 12: Unmatched target incubation with ribozyme at 640 minutes. To examine the ability of the ribozyme to reduce levels of M6P/IGF2R mRNA in cultured cardiac myocytes, total RNA was extracted from cells infected with Ad-GFP/IGF2R-Rz or Ad-GFP, and subjected to RT-PCR using M6P/IGF2R-specific primers. Primers specific for β-actin were added to a parallel reaction to serve as an internal standard. Cells were used 4 days after infection, with average infection efficiency of 70–80% (for which a viral dose used had minimal cytotoxicity). The RT-PCR product of M6P/IGF2R was 856 bp, and the β-actin product was 285 bp. As shown in Fig. 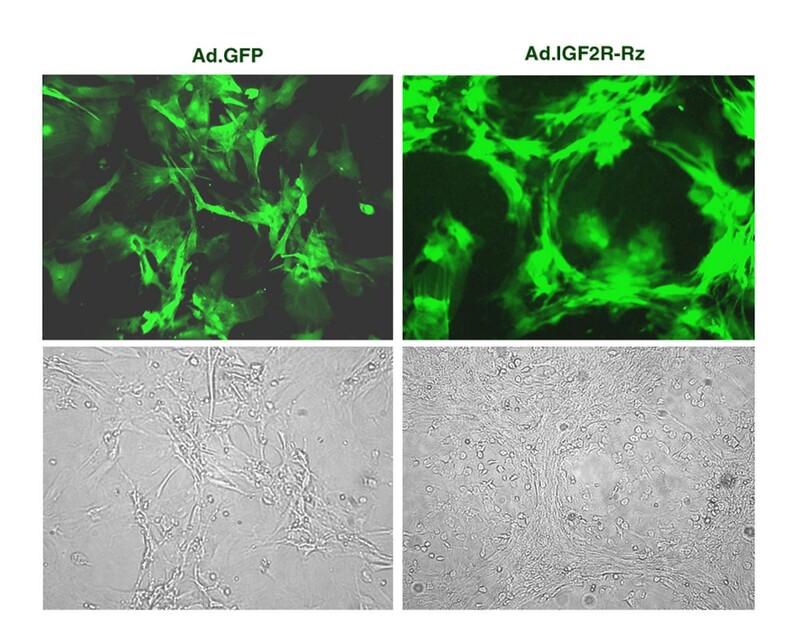 2A, the Ad-GFP/IGF2R-Rz-infected cells exhibited a significantly lower level of M6P/IGF2R mRNA than Ad-GFP-infected cells, with a reduction of about 50%. This result was confirmed by ribonuclease protection assay (RPA), in which GAPDH was used as a control (Fig. 2C &2D). There was no significant difference in the level of M6P/IGF2R mRNA between Ad-GFP-infected cells and uninfected cells (data not shown), indicating that infection with the adenovirus itself did not alter the endogenous M6P/IGF2R mRNA level. The results demonstrated that the ribozyme was highly effective in suppressing M6P/IGF2R expression in cultured cardiac myocytes. 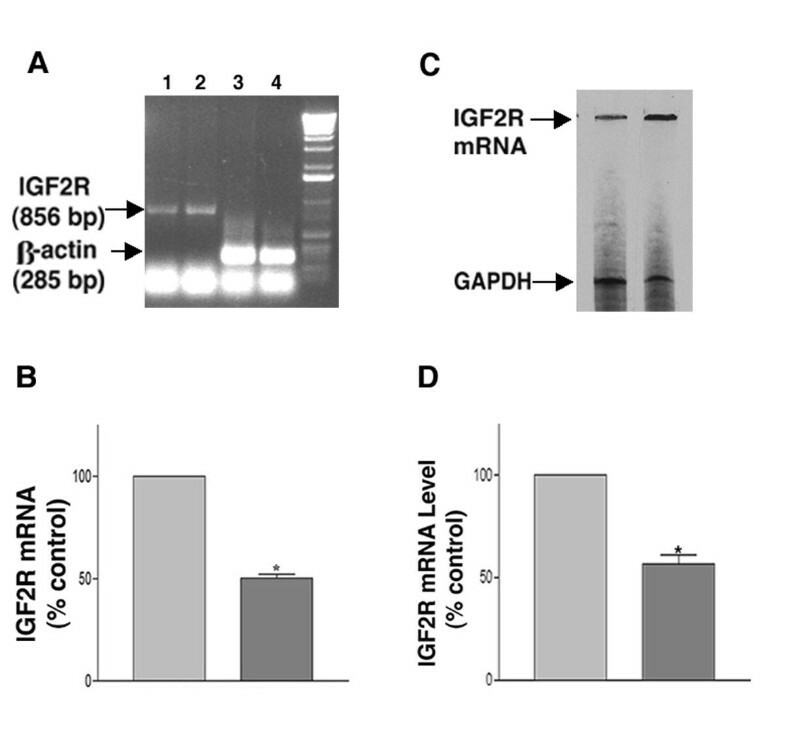 Effect of the ribozyme on M6P/IGF2R mRNA in cardiac myocytes. (A) A representative RT-PCR result showing the levels of M6P/IGF2R mRNA (lanes 1 and 2) and the corresponding amounts of β-actin mRNA (lanes 3 and 4) in the ribozyme-treated myocytes (lane 1, lane 3) and in the control cells (lane 2, lane 4). (B) Bar chart showing percent change in M6P/IGF2R mRNA of the ribozyme-treated cells relative to the mRNA fraction in the control cells (normalized to β-actin). The data are average ± SE of at least three independent experiments (*, P < 0.05 versus control). (C) RPA analysis of M6P/IGF2R down-regulation by ribozyme treatment (lane 1, ribozyme-treated; lane 2, control) (see methods for procedure). A probe targeting the GAPDH gene was used as an internal control. (D) Bar chart showing percent change in M6P/IGF2R mRNA of the ribozyme-treated cells relative to the mRNA fraction in the control cells (normalized to GAPDH). The data are average ± SE of at least four independent experiments (*, p < 0.05 versus control). To determine the effect of the ribozyme on the functional activity of M6P/IGF2R, binding and internalization of exogenous 125I-IGF-II was measured in cells infected with Ad-GFP/IGF2R-Rz. As shown in Fig. 3A, cells infected with Ad-GFP/IGF2R-Rz showed a 54% reduction in 125I-IGF-II internalization when compared with the control cells (infected with Ad-GFP). We also examined the effect of the ribozyme on the M6P-binding activity of the M6P/IGF2R using the M6P-bearing lysosomal enzyme, β-glucuronidase, as a probe. The results showed that the maximal M6P-binding capacity of cells treated with the ribozyme was about 50% less than that of controls (Fig. 3B). Furthermore, we assessed the ability of cells to internalize exogenous β-glucuronidase after treatment with ribozyme. Similarly, the M6P-inhibitable endocytosis of β-glucuronidase by ribozyme-treated cells was about 52% less than that of control cells (Fig. 3C). These results confirm that the number of functional M6P/IGF2R in ribozyme-treated cells was reduced. Effect of the ribozyme on the internalization of 125I-labeled IGF-II (A). 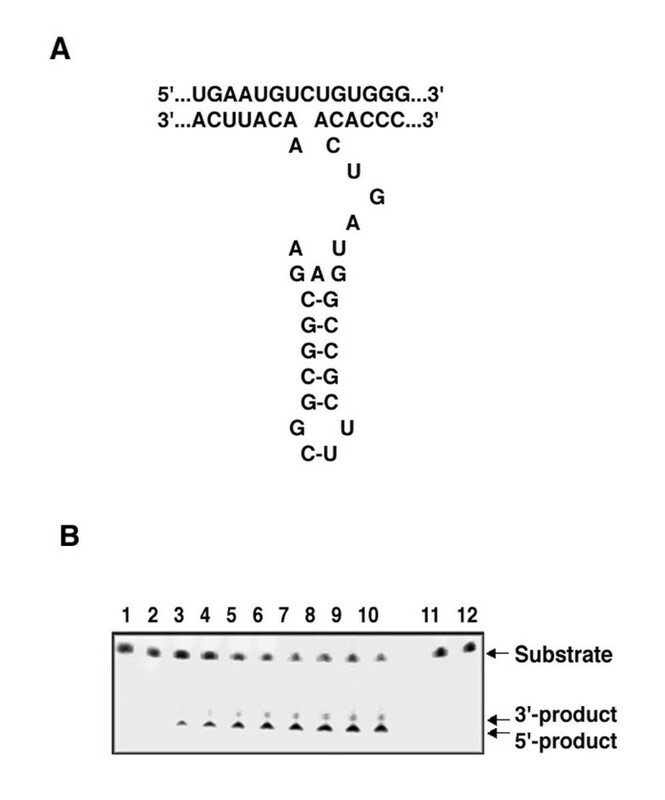 Ribozyme-treated or control cells were incubated in serum-free F-10 culture medium containing 125I-labeled IGF-II with or without excess unlabeled IGF-II. Following the incubation, cell-associated radioactivity was determined by a γ counter. Determination of binding (B) and endocytosis (C) of M6P-containing protein in cells. The M6P/bearing enzyme β-glucuronidase was used as a probe. The M6P-inhibitable binding was measured by incubating saponin-peameabilized cells with β-glucuronidase in the presence or absence of M6P. The M6P-inhibitable uptake was determined by incubating cells with medium containing β-glucuronidase in the presence or absence of M6P. Following incubation, cells were washed extensively, and cell-associated β-glucuronidase was measured fluorometrically. The data are average ± SE of at least four independent experiments (*, p < 0.05 versus control). We examined the effects of the ribozyme on the growth of cultured neonatal rat cardiac myocytes. 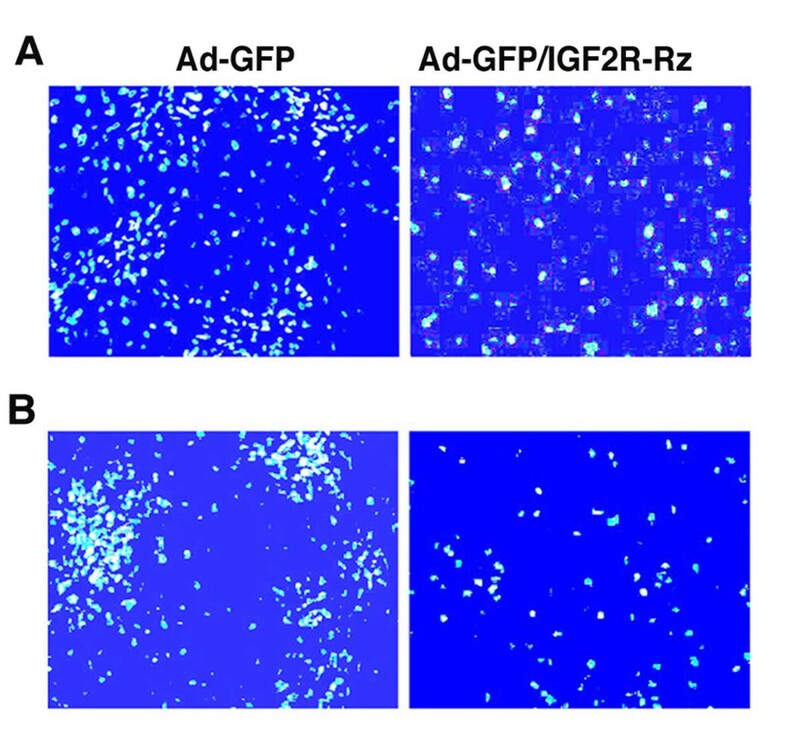 Morphological evaluation showed a remarkable difference in growth pattern between Ad-GFP/IGF2R-Rz-infected cells and the control cells: the ribozyme-expressing cells formed larger and more spread colonies (Fig. 4). 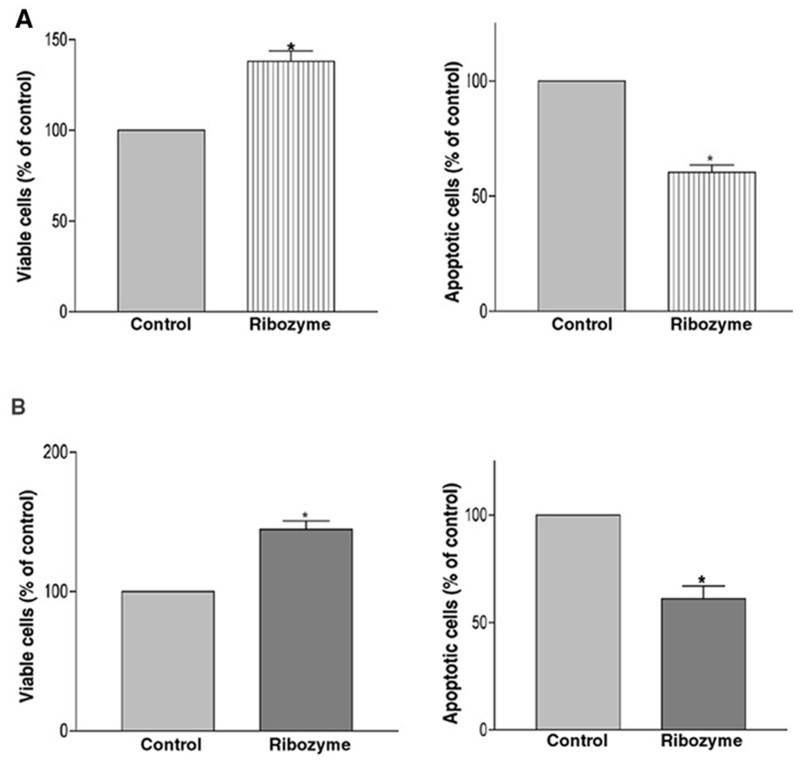 Assessment of cell proliferative activity by the MTT assay and counts of viable cells showed that the number of cardiac myocytes in ribozyme-expressing cultures was significantly higher than in control cultures (Fig. 5). These results indicate that treatment with M6P/IGF2R-ribozyme can promote cardiac myocyte proliferation. Microphotographs showing the effect of the ribozyme on the growth of neonatal rat cardiac myocytes. Cells were infected with Ad-GFP/IGF2R-Rz or Ad-GFP. The photographs were taken directly from the culture plate under 510 nm light (upper panels) and under bright light (lower panels) using a fluorescence microscope. Effects of the ribozyme on proliferation of cardiac myocytes. Cells were infected with Ad-GFP/IGF2R-Rz or Ad-GFP, and then analyzed by MTT assay (A) and by cell counts (B). The data are average ± SE of at least four independent experiments (*, p < 0.05 versus control). We examined the effects of ribozyme expression on TNF-α and hypoxia-induced apoptosis of cultured cardiac myocytes. After a 24 hr challenge with hypoxia, the number of apoptotic cells in M6P/IGF2R-Rz expressing cultures was 38% lower than in control cultures as determined by Hoechst staining (which highlights the nuclei of apoptotic cells) and ELISA (Fig. 6A, 7A). MTT analysis showed that the number of viable cells in ribozyme-treated cultures was 40% higher than in control cultures (Fig. 7A). Effects of the IGF2R ribozyme on the apoptosis induced by hypoxia and TNF treatment in cardiac myocytes. Cells were infected with Ad-GFP (control) or Ad-GFP/IGF2R-Rz. 72 hours post infection, cells were challenged with either hypoxia (A) or TNF (B) for one day and then cell death was examined using a fluorescence microscope. Cells were stained with Hoechst dye for nuclei and observed under 480 nm blue-fluorescent light. The bright blue spots are the nuclei of apoptotic cells. Effect of the ribozyme on the apoptosis and viability of cardiac myocytes. Cells were infected with either Ad-GFP or Ad-GFP/IGF2R-Rz and challenged with hypoxia (A) or TNF (B). Apoptotic cells were assayed using the Cell Death ELISA assay and cell viability was analyzed by MTT assay. The data are average ± SE of at least three independent experiments (*, p < 0.05 versus control). After treatment with TNF-α, as shown in Fig. 6B, a large number of control cells underwent apoptosis, as indicated by morphological changes (small round shape) and bright blue nuclear staining. 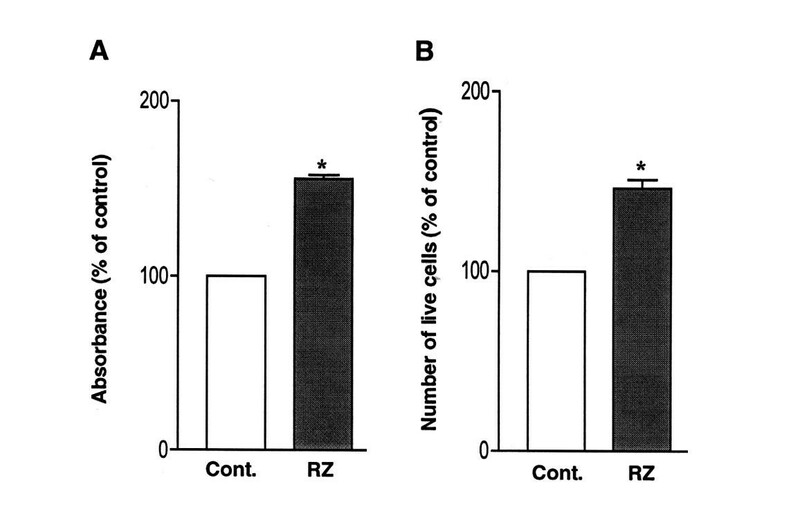 There were significantly more apoptotic cells in control cultures than in cultures expressing the Ad-GFP/IGF2R-Rz. The number of apoptotic cells, as measured by the cell death ELISA assay, in cultures infected with Ad-GFP/IGF2R-Rz was significantly (about 40%) lower than in cultures infected with Ad-GFP (Fig. 7B). Accordingly, the number of viable cells, as measured by MTT analysis, in cultures infected with Ad-GFP/IGF2R-Rz was significantly (about 45%) higher than in cultures infected with Ad-GFP (Fig. 7B). These results are consistent with the hypothesis that decreasing M6P/IGF2R expression by ribozyme treatment can reduce cell apoptosis. Some 62,000,000 Americans have one or more types of cardiovascular disease (CVD) and CVD is the leading cause (40.1%) of death in the United States. Myocardial infarction and heart failure, conditions accompanied by cardiac myocyte apoptosis, represent 23% of all CVDs and are a growing clinical challenge in need of novel therapeutic strategies. In this study, we investigated the M6P/IGF2R as a potential new therapeutic target for reduction of cardiac apoptosis and cardiac injury in these conditions. Using ribozyme technology we down-regulated the expression of the M6P/IGF2R in neonatal cardiac myocytes. We then examined cell proliferation and apoptosis under normal conditions and post challenge with either hypoxia, a model of ischemia-reperfusion, or TNF-α, a cytokine implicated in the pathogenesis of chronic heart failure . Our results demonstrate an association of a decrease in the expression and function of the M6P/IGF2R with increased cell proliferation and decreased cell susceptibility to hypoxia- and TNF-induced apoptosis. Expression of the ribozyme targeted against the M6P/IGF2R in cardiomyocytes resulted in down-regulation of M6P/IGF2R expression, as measured by RT-PCR and RPA, and of M6P/IGF2R function, as indicated by a decrease in internalization of 125I-IGF-II, and β-glucuronidase binding and endocytosis. MTT analysis and viable cell counts showed that ribozyme-mediated down-regulation of M6P/IGF2R resulted in a marked increase in cell proliferation of cardiomyocytes, which normally express high levels of M6P/IGF2R  and have limited proliferative capabilities . These results are consistent with the findings of previous knockout studies [9, 10]. Since the M6P/IGF2R has multiple actions on cell growth, its proliferative effect on the heart cells observed in this study might involve multiple mechanisms. However, it is likely that unchecked IGF-II stimulation plays a key role in the effect. Because the M6P/IGF2R is believed to sequester and degrade IGF-II , a decrease in M6P/IGF2R expression and function could result in decreased degradation and hence increased bioavailability of IGF-II to the IGF-I receptor, which mediates the growth-promoting effect of IGF-II. Supporting evidence for the involvement of IGF-II in the proliferative effect resulting from loss of M6P/IGF2R function comes from studies of M6P/IGF2R knock-out mice. M6P/IGF2R-null mice display global hyperplasia that coincides with elevated levels of IGF-II. Most importantly, however, the lethal nature of an M6P/IGF2R-null phenotype is reversed in an IGF-II-null background . Our results showing that ribozyme-mediated down-regulation of M6P/IGF2R lead to a decrease in IGF-II internalization support the above possibility. However, further investigation to confirm this mechanism is warranted. More importantly, our results also showed that M6P/IGF2R down-regulation resulted in decreased sensitivity of cardiomyocytes to hypoxia- and TNF-induced apoptosis. There is evidence that lysosomal enzymes, such as cathepsins B and D contribute to hypoxia- and TNF-induced apoptosis in vitro [22–25] and in vivo [26, 27]. The M6P/IGF2R has been shown to be involved in binding, transport and activation of lysosomal enzymes, including cathepsins [4, 5]. Therefore, it is possible that down-regulation of the M6P/IGF2R results in improper trafficking and activation of cathepsins. This, in turn would eliminate the apoptotic cascades triggered by these enzymes under hypoxia and TNF stimulation and result in decreased sensitivity of cardiomyocytes to apoptosis. It has also been shown that TNF stimulation involves the activation of TGF-β [28–30], a ligand of M6P/IGF2R that has been implicated in the progression of chronic heart failure [11, 31]. Therefore, down-regulation of M6P/IGF2R expression could also lead to a decreased bioavailability of activated TGF-β, thereby decreasing the sensitivity of cardiomyocytes to the TNF/TGF-β apoptotic pathway. The detailed mechanism of the observed effects is unknown and requires further investigation. The present study demonstrates that ribozyme-mediated down-regulation of expression and functional activity of the M6P/IGF2R results in a decrease in the susceptibility of cardiac myocytes to apoptotic stimuli. These findings suggest that this receptor might be involved in cardiac cell growth and apoptosis. The ability of the M6P/IGF2R ribozyme to reduce M6P/IGF2R expression and function in transfected cells verifies the utility of the ribozyme in studying the role of M6P/IGF2R in cardiomyocyte growth and apoptosis. In addition to its utility as a research tool, the ribozyme, with further exploration and development, might have potential application as a therapeutic agent to prevent cell death or promote mitogenesis for certain clinical conditions, such as, myocardial infarction and chronic heart failure. The nucleotide numbers of the rat M6P/IGF2R sequence targeted by the hammerhead ribozyme is 1147–1160 after coding site (exon 9). The structure of the M6P/IGF2R hammerhead ribozyme is shown in Fig. 1. A 49 bp M6P/IGF2R ribozyme oligonucleotide, 5'-GAATTCCCC ACACTG ATGAGCCGCTTCGGCGGCGAAACATTCAAC GCGT-3' and the corresponding reverse complementary strand were synthesized. The fragments were subcloned to produce a plasmid containing a ribozyme against M6P/IGF2R. For construction of the recombinant adenovirus containing the M6P/IGF2R-ribozyme (pAd-GFP/IGF2R-Rz), the segments containing the ribozymes were amplified by PCR and cloned into a pAdTrack-CMV vector and then recombined homologously with an adenoviral backbone pAdEasy 1 vector to generate (pAd-GFP/IGF2R-Rz), following the protocol described by He et al. . The pAd-GFP/IGF2R-Rz carries both the IGF2R-Rz and GFP (as reporter) genes, each under the control of separate cytomegalovirus (CMV) promoters. Another viral vector, pAd-GFP, which carries the GFP gene only under the control of the CMV promoter, was generated and used as a control vector. The adenoviral vector DNA were linerized with Pac I and transfected into the replication-permissive 293 cells (E1A transcomplementing cell line) by using Lipofectamine (Life Technologies) to produce E1-deleted, replication-defective recombinant adenovirus as described previously . Large-scale amplification of recombinant adenovirus in 293 cells was followed by purification using a discontinuous CsCl gradient. The constructs were confirmed by enzymatic digestion and DNA sequencing. Plasmids containing the ribozyme or the substrate (either 45 bp of M6P/IGF2R mRNA or an unmatched sequence 5'-GTGCTGTCTGTATG-3') were linearized with MluI, respectively. All transcripts were generated with T7 RNA polymerase (Promega). Substrate transcripts were labeled by incorporation of [α-32P] UTP (NEN Life Science Products, Inc.). Specific activity of the [α-32P] UTP (10 μCi/μl) and the base composition of each substrate molecule were used to calculate the substrate concentration. Ribozyme transcripts were quantified spectrophotometrically. (The half-life of the M6P/IGF2R target is about 280 minutes). Cleavage reaction mixture contained substrate RNA (40 nM), increasing amounts of ribozyme (60 nM), 20 mM MgCl2 and 20 mM Tris-HCl, pH8.0, in a final volume of 10 μl. The mixture was incubated at 37°C for a time-course of cleavage reaction from 0, 5, 10, 20, 40, 80, 160, 320, to 640 minutes and the cleavage reaction was stopped by addition of loading buffer (80% formamide, 10 mM Na2EDTA, pH 8.0, and 1 mg/ml each bromophenol blue and xylene cyanol). Cleavage products were analyzed on a 15% polyacrylamide and 8M urea gel. Product and substrate fragments were quantitated by using NIH Imager. Cardiac myocytes were isolated from 1-day-old newborn rats using the Neonatal Cardiomyocyte Isolation System (Worthington). The isolated cells were plated in 6-well plates and cultured in F-10 medium containing 5% (vol/vol) FBS and 10% (vol/vol) horse serum at 37°C in a tissue culture incubator with 5% CO2 and 98% relative humidity. Cells were used for experiments after 2–3 days of culture. Viral infections were carried out by adding viral particles at various concentrations (usually, 2 × 108 virus particles/ml) to culture medium containing 2% (vol/vol) FBS. Initially, optimal viral concentration was determined by using Ad-GFP to achieve an optimal balance of high gene expression and low viral titer to minimize cytotoxicity. After 24 hours of incubation, the infection medium was replaced with normal (15% vol/vol serum) culture medium. For treatment with IGF-II, cells were incubated with 50 ng/ml IGF-II after 24 hours infection with Ad-GFP/IGF2R-Rz or Ad-GFP. Four days after infection, cells were used for analysis of gene expression of M6P/IGF2R and its effect on cell growth and apoptosis. The M6P/IGF2R transcripts were determined by both RT-PCR and Ribonuclease Protection Assay (RPA). RT-PCR was performed using the GeneAmp EZ rTth RNA PCR kit (Roche). Total RNA was extracted from cultured cells using an RNA isolation kit (Qiagen,), according to the manufacturer's protocol. M6P/IGF2R transcripts were amplified using the primers (5'-GACAGGCTCGTTCTGACTTA-3') and (5'-CTTCCACTCTTATCCACAGC-3') specific to the M6P/IGF2R. Each RT-PCR assay was performed in triplicate and product levels varied by less than 3.2% for each RNA sample. Primers specific for β-actin cDNA were added to a parallel reaction to standardize for variations in PCR between samples. PCR products were resolved on a 1.0% agarose gel, visualized under UV light and quantitated using NIH Imager. RPA was performed using the RPA III kit (Ambion, Austin, TX). Briefly, total RNA was extracted from cultured cells using a total RNA isolation reagent (TRIzol, Gibco BRL) according to the manufacturer's protocol. The plasmid containing the rat M6P/IGF2R gene was linearized and used as a transcription template. Antisense RNA probes were transcribed in vitro using [33P]-UTP, T7 polymerase (Riboprobea System T7 kit, Promega), hybridized with the total RNA extracted from the rat cardiomyocytes, and digested with ribonuclease to remove non-hybridized RNA and probe. The protected RNA·RNA was resolved on a denaturing 5% sequence gel and subjected to autoradiography. A probe targeting the GAPDH gene was used as an internal control. Cells were incubated at 37°C for 2 hrs in serum-free F-10 culture medium containing 125I-labeled IGF-II (0.5 ng/ml) with or without excess unlabeled IGF-II (2 μg/ml). Following the incubation, the cells were washed three times with ice-cold PBS, and cell-associated radioactivity was determined by a γ counter. Specific internalized 125I-IGF-II was calculated by subtracting the count of samples with excessive unlabeled IGF-II from that without unlabeled IGF-II, and normalized to protein contents. Binding of β-glucuronidase was assayed as described previously [34, 35]. Briefly, cells were permeabilized with 0.25% saponin in 50 mM Hepes (pH 7.0), 150 mM NaCl, 5 mM β-glycerophosphate, 0.5% human serum albumin, and 10 mM mannose-6-phosphate (M6P) for 30 minutes on ice. The cells were washed three times with ice-cold PBS containing 0.05% saponin. They were incubated with 20,000 units/ml β-glucuronidase from bovine liver (Sigma) in 50 mM Hepes (pH 7.5) containing 150 mM NaCl, 5 mM β-glycerophosphate, 0.5% human serum albumin, 0.5% saponin with or without 10 mM M6P overnight on ice. Cells were washed five times with ice-cold PBS containing 0.05% saponin and sonicated in 100 mM sodium acetate (pH 4.6). The protein concentration of solubilized cell extract was measured and enzyme activity was assayed as follows: for each reaction 50 ul cell extract were added to 500 ul of 100 mM sodium acetate (pH 4.0) containing 1 mM paranitrophenyl (PNP)-β-glucuronide (Sigma) as substrate. After an incubation period of 3 hours at 37°C, 500 ul 1 M Na2CO3 were added to each reaction and the absorbance was measured at 400 nm. Experimental values were compared to a standard curve that was constructed using 1–100 nM solutions of PNP (Sigma) in 500 ul 100 mM sodium acetate and 500 u1 1 M Na2CO3. Specific activity was calculated as nM of PNP produced/hour/mg of protein. Beta-glucuronidase endocytosis assay was carried out as described previously . Briefly, confluent cell cultures were washed twice with pre-warmed serum-free DMEM followed by incubation with DMEM containing 5 mg/ml human serum albumin and 10 mM M6P for 20 minutes. Following incubation cells were washed 3 times with pre-warmed DMEM. Cells were then incubated in DMEM containing 5 mg/ml human serum albumin alone or 4000 units β-glucuronidase with or without 10 mM M6P for 2 hours at 37°C. Following the incubation, the cells were washed 5 times with ice-cold PBS and subjected to enzyme activity assay as described above. Cardiac myocytes were grown in culture plates (tissue culture grade, 12 wells, flat bottom) in a final volume of 1 ml serum-containing culture medium per well, in a humidified atmosphere (37°C and 5% C02) for 3 days. After infection with Ad-GFP/IGF2R-Rz or Ad-GFP, cells were incubated with or without 50 ng/ml IGF-II for 4 days. Following supplementation with IGF-II, 100 μl MTT labeling reagent (Roche) were added to each well and cells were incubated for 4 hours, followed by addition of 1 ml solubilization solution into each well. The plate was placed in an incubator at 37°C overnight. Spectrophotometrical absorbency of the samples was measured using an UV-visible Recording Spectrophotometer with wavelength of 550–690 nm. In addition, the total number of viable cells in each treatment was counted by trypan blue exclusion method using a hemocytometer. Cells were infected with Ad-GFP or Ad-GFP/IGF2R-Rz. Seventy-two hours post infection, cells were treated with TNF (0.1 ng/ml) for 24 hrs or subjected to hypoxia. For induction of apoptosis by hypoxia, cell culture medium was changed to serum-free F-10 saturated with 95% N2/5% CO2 and cells were placed in a 37°C airtight box saturated with 95% N2/5% CO2 for 24 hrs. For normoxic controls, culture medium was changed to F-10/5%F BS/10% HS and cells were placed in a 37°C/5% CO2 incubator for 24 hrs before analysis. Apoptotic cells were identified by Hoechst staining using the Vybrant™ Apoptosis Kit #5 (Molecular Probes) according to the manufacturer's protocol. In addition, after infection with Ad-GFP or Ad-GFP/IGF2R-Rz and challenge with either TNF or hypoxia, cell viability was assessed using the MTT assay Kit (Roche Molecular Biochemicals) and cell apoptosis was determined using the Cell Death Detection ELISA Kit assay (Roche Molecular Biochemicals) according to the manufacturer's protocol. Students' t-test was used to evaluate the difference between two values. Each experiment was repeated at least three times. Statistical significance was accepted at the level of p < 0.05. We are grateful to Eric Pond and Zhao B. Kang for their technical assistance, and to Natalie Landman for her editorial assistance. This work was supported by a grant from the NIH (CA79553 to JXK). ZC carried out construction of the ribozyme, production of the viruses, cellular experiments, biochemical assays and data analysis. YG carried out the RPA assay and participated in the molecular biological studies. JXK conceived of the study, participated in its design and coordination, and drafted the manuscript.